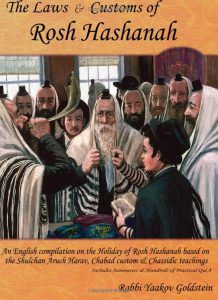 May one eat prior to Shacharis? Snacking: Some Poskim rule it is only forbidden to eat a meal, however one may eat up to a Kebeitza [55 grams] of Mezonos and have an unlimited amount of fruit and drink. [Based on this some communities are accustomed to eat after Kerias Hatorah, prior to Tekias Shofar.] Nevertheless many Poskim rule that one may not eat even a snack prior to hearing Shofar unless one is weak or sick. Practically many are accustomed to fast and not eat or drink anything until one hears Shofar. There is no prohibition in doing so even if one will only be able to eat after midday. However some say that even according to the Chabad custom one may drink prior to Davening. It is accustomed not to eat prior to hearing Shofar although one may drink. Many are accustomed to fast until they hear Shofar. Is one who is old or weak or sick and thus needs to eat to hear Shofar early in the morning? As explained above one who is sick or weak may eat up to 55 grams of Mezonos, unlimited amount of fruit and vegetables, and unlimited amount of beverages prior to Shacharis. However they may not eat a full meal or over 55 grams of Mezonos until they hear Shofar. Thus if they feel a need to eat a meal they should hear the Shofar early before Davening and then eat. Furthermore, some Poskim rule that in all cases that one feels he needs to eat, if possible, he should hear Shofar beforehand and only then eat. May women eat prior to hearing Shofar? It is customary for women not to eat at all until they hear Shofar. However from the letter of the law women are allowed to eat up to 55 grams of Mezonos, unlimited amount of fruit and vegetables, and unlimited amount of beverages. This certainly applies to a woman who is pregnant, nursing or feels weak. However she should not eat a full meal or over 55 grams of Mezonos until she hears Shofar. If however they feel that they require this amount of food to eat then it is completely allowed. Nevertheless, some Poskim rule that in all cases that a woman feels she needs to eat, if possible, she is to hear Shofar beforehand and only then eat. See Piskeiy Teshuvos 585/2; Hearos Hatemimim Veanash 770 vol. 322 p. 64 for a general overview of this subject; See “Noam” 19 p. 181-188 for an article of Rav Yosef Simcha Ginzberg on this topic. Mateh Efraim 588/2; Alef Hamagen 581/81; Ashel Avraham Butchach 589/3; Takanos Rav Akiva Eiger that even during the epidemic he ruled to only eat after Tekios Meyushav; See Kaf Hachaim 585/26 for a discussion why this was not explicitly mentioned in Poskim by Shofar; See Piskeiy Teshuvos ibid footnote 10; This prohibition applies before all time dependent Mitzvos: 1) Regarding Mincha and Maariv: See 232/2; 235/2; 2) Regarding Bedikas Chameitz see: 431/5; 3) Regarding Lulav see: 652/2; 4) Regarding Megillah see: Rama 692/4; M”B 692/15; Kaf Hachaim 692/37. The reason: As is the case whenever one has a Mitzvah that must be fulfilled by a certain time, that one may not eat a meal until he fulfills the Mitzvah due to fear he may come to forget to perform the Mitzvah. See Alef Hamagen 581/81 [in footnote that all snacking is permitted before a Mitzvah]; Darkei Chaim Veshalom 716 [regarding tea and coffee]; Hisorerus Teshuvah 147; Olas Shmuel 82; Tzitz Eliezer 6/7; 7/32; 8/21; Az Nidbaru 1/10; Kaf Hachaim 585/26 [brings opinions in this matter]; See “Noam” ibid. Regarding eating between Kerias Hatorah and Tekias Shofar and whether Kiddush is required-see Halacha 13A! Rokeach Hagadol 353, brought in Alef Hamagen 581/81 and 588/2; Beshamayim Rosh 74; Pischeiy Olam 74; see Sdei Chemed Daled Minim 3/22 and so writes Hiskashrus, and Otzer Minhagei Chabad 176, and so is custom of many of Anash. Background: See 288/1 that it is forbidden to fast until midday on Shabbos, even if one does not intend to do so as a fast. The same applies towards Yom Tov and Chol Hamoed. [M”A 652/4; M”B 652/7 regarding Chol Hamoed Sukkos] Nevertheless the above Poskim ibid rule that on R”H one may fast even past midday. This complies with the ruling of the previously mentioned Poskim that women do not eat prior to Shofar. Thus if one is able to satiate themselves with other foods which are allowed from the letter of the law, it is better to do so. Furthermore, some Poskim [Ashel Avraham; Ateres Zikeinim ibid] rule that they should hear Shofar early in all cases rather than eat beforehand. Thus it is certainly best to avoid eating a meal or over 55 grams of Mezonos when avoidable. Chayeh Adam 141/7; Kitzur SH”A ibid; Ashel Avraham ibid [They do not limit the amount of food that they may eat]; Piskeiy Teshuvos 585/2.